When Evey Hammond (Natalie Portman) is caught roaming the streets after curfew by government officials and almost raped, a mysterious stranger rescues her wearing a mask of Guy Fawkes. 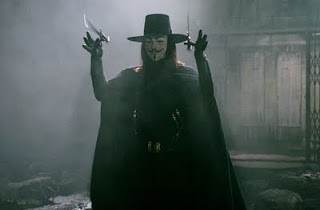 Known only as “V” (Hugo Weaving), this renegade makes a public announcement that in one year, on November 5, he intends to carry out the unfinished work of Guy Fawkes by destroying both houses of Parliament. The film takes place over the course of that year, which V spends violently getting back at those in power who have wronged his country. Based on a graphic novel by Alan Moore, the film has more in common with comic book adaptations like Road to Perdition and A History of Violence than it does with typical superhero fare. In fact, V is no superhero; he’s a terrorist ... or is he a revolutionary? Both, I suppose; it’s a fine line. Some have already spoken out against V for Vendetta, calling it an endorsement of terrorism, but this film doesn’t suggest that violent revolution should be used against the British government of today. The film is a bold reminder of how a powerful government can, in the name of freedom, scare people into giving their freedoms away. There are multiple allusions to Nazism, but there are also implications that America’s “War on Terror” could lead to dangerous infringements on freedom. While trying to analyze V’s plan of action, a government official says, “He’s a terrorist; we can’t expect him to act like you or me.” When people begin to dehumanize terrorists, they fall victim to the same illogic used by the terrorists themselves. The all-powerful, tyrannical government greatly resembles other futuristic stories, such as George Orwell’s 1984 or Ray Bradbury’s Fahrenheit 451. What this film does well is make the future seem immediate; there are enough allusions to modern situations that we feel as though this could all transpire within our lifetime. That’s not to say that it all seems realistic; many scenes lack believability. The film succeeds, not because all that transpires seems real, but because the ideas and emotions are real. V for Vendetta oozes with style, which comes as no surprise seeing as how the Wachowski Brothers (creators of The Matrix Trilogy) wrote the script and produced the film. The director, James McTeigue, was an assistant-director on all three Matrix films. V for Vendetta has action sequences, but that’s not all it has. It’s simultaneously a political thriller, a science fiction story, and an action film. I know some will criticize the film for stretching itself too thin, but I think it really succeeds in all three genres. As for the script, some fans of the graphic novel have criticized it for straying from the original source material. In the graphic novel, Evey Hammond is a prostitute; in the film, she works for a television station. The novel contains no romance between Evey and V and some of the other characters have been reworked. The film does retain the spirit of the original, though, and much of the film’s dialogue is adapted directly from it. There are lines and images that are very poignant and will stay with you long after the credits have rolled.